It's all about the fit while seated on your bike. Ride, Eat, Sleep, Repeat. You’ll find a t-shirt with these words on it for sale in the Aerostich catalog, and these are the four words that pretty much sum up what we do here at Motorcycledaily.com, especially me. I began my life on motorcycles, almost literally. As long as I can remember, two wheels and handlebars were a prominent part of my life, thanks to my parents. Many bikes, and many miles have passed through my two-wheeled history which began in the 70s. Starting in Florida, where the heat and humidity conspire to make jeans and a t-shirt seem like a good idea, to today in Southern (but it’s a dry heat) California, where I now live. During much of this time, riding gear consisted primarily of helmets, jackets, jeans and gloves, whether I was a passenger or pilot. In 1986, racing at Willow Springs revealed the protective virtues of leather suits, and I began wearing them almost all of the time on the street. The added protection was welcome, but they were generally uncomfortable over long distances, did not breathe in the heat, nor keep me warm in the cold or dry in the rain. These “leathers” also had no pockets, and were too tight to wear anything underneath more substantial than bicycle shorts and a sweatshirt (which doesn’t work well after arriving at your destination, unless it’s Alice’s Restaurant or a similar establishment). Did I mention that they were fairly impractical for day-to-day use? So, I went back to motorcycle jackets and jeans, but now felt vulnerable. More years go by, and now it’s 1997. 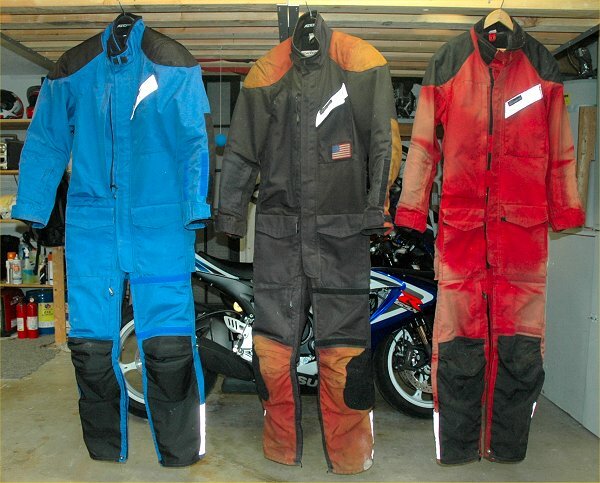 I’m on the east coast riding year ’round and need, more than ever, a riding suit that does it all. Lots of research leads me to Aerostich, and while the product certainly seemed to fulfill my criteria, it also seemed rather pricey. I put the aftermarket exhaust system and jet kit for my bike on hold and got the suit instead – winter was coming up fast. It turned out to be a very wise decision and the suit’s exemplary performance caused a mental shift in my accessory buying priorities. What weas it about this suit that caused such a ripple in my riding experience? Well, I’m glad you asked, because leaving the garage on the bike without my Aerostich is no longer an option ……….. The main part of the one-piece suit is made up of 500 denier cordura nylon, with a special Gore-Tex laminate underneath to make it possible for the fabric to breathe while repelling water. At the shoulder, forearms, elbows, knees and shins, 1050 denier ballistic nylon is used to cover TF2 Hard-Shell pads, an expensive, high-performance viscoelastic material originally developed for aerospace applications. The foam feels pliable, with a little stiffness, but in an impact, it firms up considerably, distributing and dissipating the impact energy. These pads are removable for washing the suit. Pay attention to how the pads come out of their respective pockets, they’re challenging enough to get back in there when you are a practiced hand….. Going a step further, TF2 hip pads are offered as an accessory, as is a back protector. Bohn also produces a back protector specifically for fitment in the Roadcrafter suit. For organizations allowing the wearing of an Aerostich suit during track days, these two additions would be a wise expenditure. An option for Velcro fastening of knee sliders is available for those headed to the track. Night time riding is addressed with liberal use of reflective 3M Scotchlite. Going across the full width of the vent flap on the back, the ankle closure flaps and angled pocket flap up front it would be virtually impossible to go unnoticed after the sun goes down. At neck level, protection against chafing is addressed with a layer of ultra suede on the inside of the mandarin collar. A Velcro closure tab allows you to seal the neck from the elements, but a 2 inch or so longer closure tab would work better in the winter when using wind triangles and the like to insulate the neck from the cold. Adjustment tabs at the wrists and ankles and waist allow the wearer to fine tune the fit of the suit. Air flow through the suit is well handled by vents across the back, under the arms and hips. Zippers control the size the the openings, and hence, the air flow. Additionally, you can leave the collar partially open to help on the hotter days of summer. If you wear a back pack, you’ll effectively block the exhaust vent across the back, and drastically reduce the suit’s ability to flow air. And now, for one of the best features of this suit – POCKETS! Lots of them! There are 10 of them, in fact. With all the onboard storage, you could almost get away with leaving the tankbag at home, but not quite. 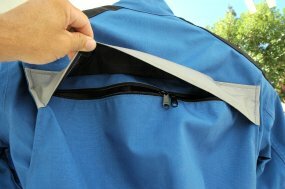 If there aren’t enough pockets for you, Aerostich has more available as accessories to Velcro into place. The large pocket on the right side of the chest has a full-length zipper that, if not consciously checked after each stop, will inevitably be left open. If you’re lucky, the contents of the pocket will drop into your lap. If you’re not so lucky, you may end up replacing a cell phone earlier than planned…….. Just a friendly warning. Wearing the suit becomes second nature — indeed, perhaps like a second skin. After practicing the technique described on their website, you can be in the suit, all zipped up, in about 10 seconds, and not have to remove whatever footwear you have on. With a loose fit over street clothes, you maintain good flexibility, and an ability to wear a formal suit underneath, protected from the elements to arrive at work or a function looking as if you’d stepped from a car. In cold weather (down into the teens cold), the loose fit provides room to layer underneath and/or wear electric clothing. It also fends off rain showers pretty well. It’s no plastic rain suit, but Aerostich doesn’t claim it be one. Water will eventually seep into the crotch area, since water tends to pool in the creases formed when you sit on the bike, but it does take a while. As far as heat goes, I’ve been in the triple digits with the suit on, and while you’re sitting still, things get real warm. Even with all the vents open, they can only do their job when I’m moving. Once underway, you can feel the air moving through the suit, and you’re fairly comfortable on warm days. If you haven’t filled the pockets with stuff, you can put ice in them to keep you cool while it melts. I haven't found anything better in over 200,000 miles. The staff at Aerostich goes to great lengths to nail down your dimensions. How the suit fits while seated on the motorcycle is the fit you’re after. You won’t use the suit if it isn’t comfortable to wear on the bike. A proper fit on the bike puts the padding in the right places. A couple of options for sportbike riders to consider are having the sleeves rotated forward and the addition of a 2 inch ellipse in the lumbar area to accommodate the more aggressive body positioning. Off the rack fitment is available for those fortunate enough to fit into a standard range. I wasn’t so fortunate and required alterations to the arms, and legs to get the padding properly positioned. My first ‘Stich didn’t have the sleeve rotation. 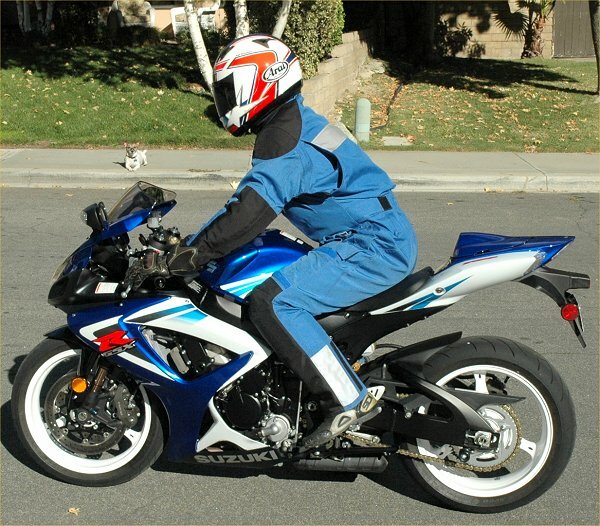 My second, and now my third suit have this option and it is worthwhile (I am most often on a sportbike). Perhaps I’ll try the ellipse, if it can be added after the fact. The suit works extremely well in all conditions a rider may face, and, with the exception of crashing in one, I’ve tested it in all of the above conditions/scenarios and the suit has always performed as advertised. My first two suits each have well in excess of 100,000 miles on them, and have collected bugs in most of the states encountered in coast-to-coast trips, with a couple extra states thrown in the mix. For those who want the option to wear just the upper, a two-piece version is also available, and it has a full zipper to attach the upper and lower half together. Do I have any gripes? I have a couple. One is the already mentioned too short neck closure tab. Another is that on my second suit, the zipper pulls on the main opening and right leg came apart fairly quick in comparison to the first suit. I used safety wire to fashion my own, since my almost non-stop use of the suit made sending it back for repair impractical. In the suit’s defense, an occasional drop of silicone into the zipper would keep its movement freer and stress would be reduced on the pull. Also, the intermittent strips of Velcro on the main opening probably could stand to be a little wider. This suit starts at $727.00 and with the discussed alterations to the arms, legs and the sleeve rotation, its price is just a few bucks over $900.00. Perhaps a bit pricey, but not as pricey as a custom fit leather suit, and the Roadcrafter is much more flexible for day to day use. 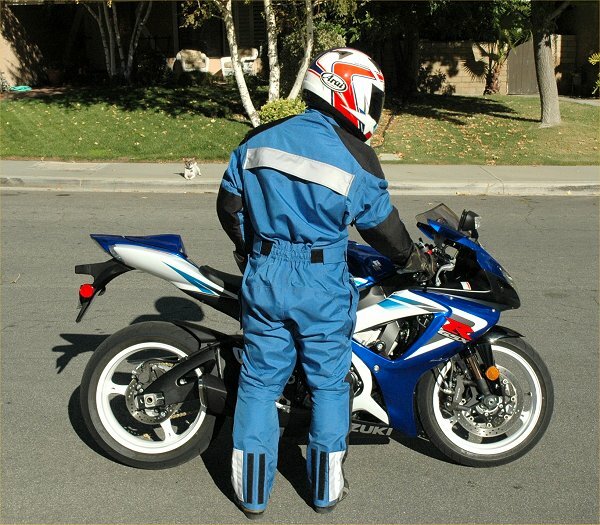 You need one of these suits, it’s worth every penny and probably cheaper than that exhaust system you’re eyeballin’…………. Check out the Roadcrafter, and everything else Aerostich has to offer, at http://www.aerostich.com.